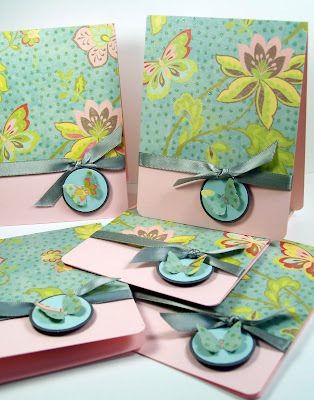 I thought I would try a little variation of one of my all time favorite layouts (which is just the simple 4x4 piece of designer paper mounted on the bottom portion of a card) to create some fast and easy card sets. For these sets I cut a piece of 4.25 x 4 piece of designer paper and mounted it to the top portion of the card. 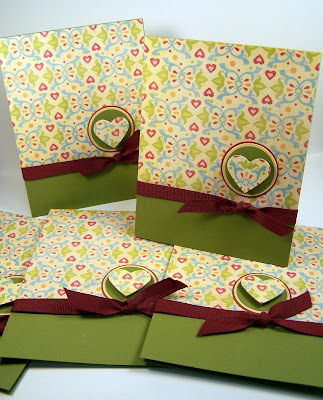 Next I used the corner rounder on the bottom corners of the card. Then comes the ribbon. . . just wrap a piece of coordinating ribbon around the card and tie it. 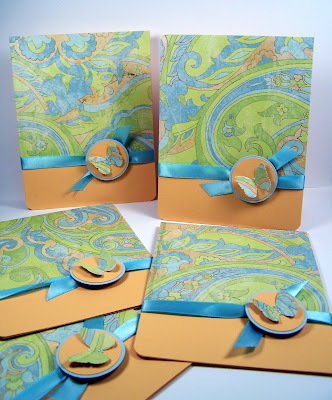 For the finishing touch get out your circle punches to create some layers for your focal point. You can stamp a little image for your focal point or pull out more punches to create them. 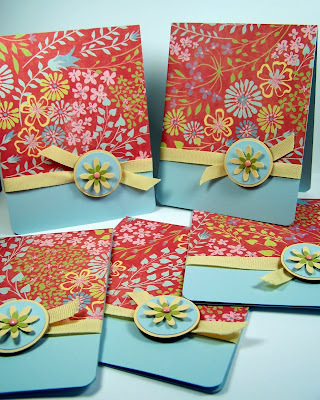 I used a Martha Stewart butterfly punch, a Martha Stewart heart punch, a SU flower punch and another smaller flower punch to finish my cards. Thanks for stopping. I hope you're having a wonderful week!